Social movements can be defined as "organizational structures and strategies that may empower oppressed populations to mount effective challenges and resist the more powerful and advantaged elites". Political science and sociology have developed a variety of theories and empirical research on social movements. For example, some research in political science highlights the relation between popular movements and the formation of new political parties as well as discussing the function of social movements in relation to agenda setting and influence on politics. Sociologists distinguish between several types of social movement examining things such as scope, type of change, method of work, type of change, range, and timeframe. Modern Western social movements became possible through education (the wider dissemination of literature) and increased mobility of labor due to the industrialization and urbanization of 19th-century societies. It is sometimes argued that the freedom of expression, education and relative economic independence prevalent in the modern Western culture are responsible for the unprecedented number and scope of various contemporary social movements. Many of the social movements of the last hundred years grew up, like the Mau Mau in Kenya, to oppose Western colonialism. Social movements have been and continue to be closely connected with democratic political systems.Occasionally, social movements have been involved in democratizing nations, but more often they have flourished after democratization. Over the past 200 years, they have become part of a popular and global expression of dissent. Modern movements often utilize technology and the internet to mobilize people globally. Adapting to communication trends is a common theme among successful movements. Research is beginning to explore how advocacy organizations linked to social movements in the U.S. and Canada use social media to facilitate civic engagement and collective action. The systematic literature review of Buettner & Buettner analyzed the role of Twitter during a wide range of social movements (2007 WikiLeaks, 2009 Moldova, 2009 Austria student protest, 2009 Israel-Gaza, 2009 Iran green revolution, 2009 Toronto G20, 2010 Venezuela, 2010 Germany Stuttgart21, 2011 Egypt, 2011 England, 2011 US Occupy movement, 2011 Spain Indignados, 2011 Greece Aganaktismenoi movements, 2011 Italy, 2011 Wisconsin labor protests, 2012 Israel Hamas, 2013 Brazil Vinegar, 2013 Turkey). 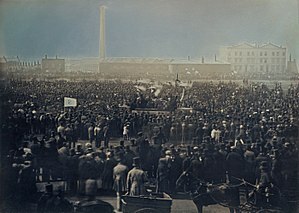 The early growth of social movements was connected to broad economic and political changes in England in the mid-18th century, including political representation, market capitalization, and proletarianization. The first mass social movement catalyzed around the controversial political figure John Wilkes. As editor of the paper The North Briton, Wilkes vigorously attacked the new administration of Lord Bute and the peace terms that the new government accepted at the 1763 Treaty of Paris at the end of the Seven Years' War. Charged with seditious libel, Wilkes was arrested after the issue of a general warrant, a move that Wilkes denounced as unlawful - the Lord Chief Justice eventually ruled in Wilkes favour. As a result of this, Wilkes became a figurehead to the growing movement for popular sovereignty among the middle classes - people began chanting "Wilkes and Liberty" in the streets. After a later period of exile brought about by further charges of libel and obscenity, Wilkes stood for the Parliamentary seat at Middlesex, where most of his support was located. When Wilkes was imprisoned in the King's Bench Prison on 10 May 1768, a mass movement of support emerged, with large demonstrations in the streets under the slogan "No liberty, no King." Stripped of the right to sit in Parliament, Wilkes became an Alderman of London in 1769, and an activist group called the Society for the Supporters of the Bill of Rights began aggressively promoting his policies. This was the first ever sustained social movement: it involved public meetings, demonstrations, the distribution of pamphlets on an unprecedented scale and the mass petition march. However, the movement was careful not to cross the line into open rebellion; - it tried to rectify the faults in governance through appeals to existing legal precedents and was conceived of as an extra-Parliamentary form of agitation to arrive at a consensual and constitutional arrangement. The force and influence of this social movement on the streets of London compelled the authorities to concede to the movement's demands. Wilkes was returned to Parliament, general warrants were declared as unconstitutional and press freedom was extended to the coverage of Parliamentary debates. In 1945, Britain after victory in the Second World War entered a period of radical reform and change. In the post-war period, Feminism, gay rights movement, peace movement, Civil Rights Movement, anti-nuclear movement and environmental movement emerged, often dubbed the New Social Movements They led, among other things, to the formation of green parties and organisations influenced by the new left. Some find in the end of the 1990s the emergence of a new global social movement, the anti-globalization movement. Some social movement scholars posit that with the rapid pace of globalization, the potential for the emergence of new type of social movement is latent—they make the analogy to national movements of the past to describe what has been termed a global citizens movement. Nascent social movements often fail to achieve their objectives because they fail to mobilize sufficient numbers of people. Srdja Popovic, author of Blueprint for Revolution, and spokesperson for OTPOR!, says that movements succeed when they address issues that people actually care about. “It’s unrealistic to expect people to care about more than what they already care about, and any attempt to make them do so is bound to fail.” Activists too often make the mistake of trying to convince people to address their issues. A mobilization strategy aimed at large-scale change often begins with action a small issue that concerns many people. For instance, Mahatma Gandhi’s successful overthrow of British rule in India began as a small protest focused on the British tax on salt. Popovic also argues that a social movement has little chance of growing if it relies on boring speeches and the usual placard waving marches. He argues for creating movements that people actually want to join. OTPOR! succeeded because it was fun, funny, and invented graphic ways of ridiculing dictator Slobodan Milosevic. It turned fatalism and passivity into action by making it easy, even cool, to become a revolutionary; branding itself within hip slogans, rock music and street theatre. Tina Rosenberg, in Join the Club, How Peer Pressure can Transform the World, shows how movements grow when there is a core of enthusiastic players who encourage others to join them. radical movement - movements dedicated to changing value systems in a fundamental way. Examples would include the Civil Rights Movement which demanded full civil rights and equality under the law to all Americans, regardless of race; the Polish Solidarity (Solidarność) movement which demanded the transformation of a Stalinist political and economic system into a democracy; or the South African shack dwellers' movement Abahlali baseMjondolo which demands the full inclusion of shack dwellers into the life of cities. innovation movement - movements which want to introduce or change particular norms, values, etc. The singularitarianism movement advocating deliberate action to effect and ensure the safety of the technological singularity is an example of an innovation movement. old movements - movements for change have existed for many centuries. Most of the oldest recognized movements, dating to late 18th and 19th centuries, fought for specific social groups, such as the working class, peasants, whites, aristocrats, Protestants, men. They were usually centered around some materialistic goals like improving the standard of living or, for example, the political autonomy of the working class. new movements - movements which became dominant from the second half of the 20th century. Notable examples include the American civil rights movement, second-wave feminism, gay rights movement, environmentalism and conservation efforts, opposition to mass surveillance, etc. They are usually centered around issues that go beyond but are not separate from class. Caution must always be exercised in any discussion of amorphous phenomena such as movements to distinguish between the views of insiders and outsiders, supporters and antagonists, each of whom may have their own purposes and agendas in characterization or mischaracterization of it[[[Category:All articles with unsourced statements]]. Social movements have a life cycle: they are created, they grow, they achieve successes or failures and eventually, they dissolve and cease to exist. They are more likely to evolve in the time and place which is friendly to the social movements: hence their evident symbiosis with the 19th century proliferation of ideas like individual rights, freedom of speech and civil disobedience. Social movements occur in liberal and authoritarian societies but in different forms. However, there must always be polarizing differences between groups of people: in case of 'old movements', they were the poverty and wealth gaps. In case of the 'new movements', they are more likely to be the differences in customs, ethics and values. Finally, the birth of a social movement needs what sociologist Neil Smelser calls an initiating event: a particular, individual event that will begin a chain reaction of events in the given society leading to the creation of a social movement. 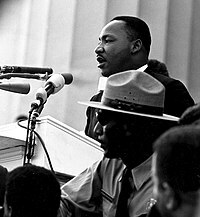 For example, the Civil Rights Movement grew on the reaction to black woman, Rosa Parks, riding in the whites-only section of the bus (although she was not acting alone or spontaneously—typically activist leaders lay the groundwork behind the scenes of interventions designed to spark a movement). The Polish Solidarity movement, which eventually toppled the communist regimes of Eastern Europe, developed after trade union activist Anna Walentynowicz was fired from work. The South African shack dwellers' movement Abahlali baseMjondolo grew out of a road blockade in response to the sudden selling off of a small piece of land promised for housing to a developer. Such an event is also described as a volcanic model – a social movement is often created after a large number of people realize that there are others sharing the same value and desire for a particular social change. In contrast to earlier collective behavior perspectives on social movements—which emphasized the role of exceptional levels of deprivation, grievance, or social strain in motivating mass protest—Resource Mobilization perspectives hold "that there is always enough discontent in any society to supply the grass-roots support for a movement if the movement is effectively organized and has at its disposal the power and resources of some established elite group"  Movement emergence is contingent upon the aggregation of resources by social movement entrepreneurs and movement organizations, who use these resources to turn collective dissent in to political pressure. Members are recruited through networks; commitment is maintained by building a collective identity, and through interpersonal relationships. ^ Opp, Karl-Dieter (2009). . Theories of political protest and social movements: A multidisciplinary introduction, critique, and synthesis. Routledge. ^ a b Deric., Shannon (2011-01-01). Political sociology : oppression, resistance, and the state. Pine Forge Press. p. 150. ISBN 9781412980401. OCLC 746832550. ^ Pugh, Jeff (2008). "Vectors of Contestation: Social Movements and Party Systems in Ecuador and Colombia". Latin American Essays. XXI: 46–65. ^ de, Leon, Cedric. Party & society : reconstructing a sociology of democratic party politics. ISBN 9780745653686. OCLC 856053908. ^ a b Obar, Jonathan; et al. (2012). "Advocacy 2.0: An Analysis of How Advocacy Groups in the United States Perceive and Use Social Media as Tools for Facilitating Civic Engagement and Collective Action". Journal of Information Policy. SSRN 1956352. ^ a b Obar, Jonathan (2013-04-22). "Canadian Advocacy 2.0: A Study of Social Media Use by Social Movement Groups and Activists in Canada". SSRN 2254742. ^ Diani, Mario (1992). "The concept of social movement". The Sociological Review. 40 (1): 1–25. doi:10.1111/j.1467-954X.1992.tb02943.x. ISSN 0038-0261. ^ McCarthy, John; Zald, Mayer N. (May 1977). "Resource Mobilization and Social Movements: A Partial Theory". The American Journal of Sociology. 82 (6): 1217–1218. doi:10.1086/226464. JSTOR 2777934. ^ James, Paul; van Seeters, Paul (2014). Globalization and Politics, Vol. 2: Global Social Movements and Global Civil Society. London: Sage Publications. p. xi. ^ Charles Tilly. "BRITAIN CREATES THE SOCIAL MOVEMENT" (PDF). ^ Cash 2006, pp. 204–26. ^ Cash 2006, pp. 216–26. ^ "The Society for the Supporters of the Bill of Rights (SSBR)". www.historyhome.co.uk. ^ Rudbeck, Jens (2012). "Popular sovereignty and the historical origin of the social movement". Theory and Society. 41 (6): 581–601. doi:10.1007/s11186-012-9180-x. ^ Brayley, Edward Wedlake; James Norris Brewer; Joseph Nightingale (1810). London and Middlesex. Printed by W. Wilson, for Vernor, Hood, and Sharpe. ^ "Lord George Gordon". Archived from the original on 2009-06-01. Retrieved 2009-07-25. ^ Horn, David Bayne; Mary Ransome (1996). English Historical Documents 1714-1783. Routledge. ISBN 978-0-415-14372-1. ^ Joanna Innes (8 October 2009). Inferior Politics:Social Problems and Social Policies in Eighteenth-Century Britain. Oxford University Press. p. 446. ISBN 978-0-19-160677-9. Retrieved 15 September 2013. ^ Eugene Charlton Black (1963). The Association British Extra Parliamentary Political Organization, 1769-1793. Harvard University Press. p. 279. ^ "Chartism: the birth of mass working class resistance". Retrieved 2012-12-17. ^ Westd, David (2004). "New Social Movements". Handbook of Political Theory. Archived from the original on 2015-02-15. Retrieved 2015-02-15. ^ 1973-, Popovic, Srdja (2015). Blueprint for revolution : how to use rice pudding, Lego men, and other nonviolent techniques to galvanize communities, overthrow dictators, or simply change the world. Miller, Matthew I., 1979- (First ed.). New York. ISBN 9780812995305. OCLC 878500820. ^ Tina., Rosenberg (2011). Join the club : how peer pressure can transform the world (1st ed.). New York: W.W. Norton & Co. ISBN 9780393068580. OCLC 601108086. ^ Roberts, Adam and Timothy Garton Ash (eds. ), Civil Resistance and Power Politics: The Experience of Non-violent Action from Gandhi to the Present Archived 2014-11-15 at Archive-It, Oxford: Oxford University Press, 2009. ISBN 978-0-19-955201-6, contains chapters on these and many other social movements using non-violent methods. ^ Graph based on Blumer, Herbert G. 1969. "Collective Behavior." In Alfred McClung Lee, ed., Principles of Sociology. Third Edition. New York: Barnes & Noble Books, pp. 65-121; Mauss, Armand L. 1975. Social Problems as Social Movements. Philadelphia: Lippincott; and Tilly, Charles. 1978. From Mobilization to Revolution. Reading, Massachusetts: Addison-Wesley, 1978. ^ a b McCarthy, John; Zald, Mayer N. (May 1977). "Resource Mobilization and Social Movements: a Partial Theory". American Journal of Sociology. 82 (6): 1212–1241. doi:10.1086/226464. ^ Turner, L.; Killian, R. N. (1972). Collective Behavior. Englewood Cliffs, N.J: Prentice-Hall. p. 251. ^ Gamson, William A. (June 1974). "The Limits of Pluralism" (PDF). CRSO Working Papers (102): 12. Retrieved 12 April 2015. ^ Piven, Francis; Cloward, Richard (Summer 1991). "Collective Protest: A Critique of Resource Mobilization Theory". International Journal of Politics, Culture, and Society. 4 (4): 435–458. doi:10.1007/BF01390151. JSTOR 20007011. ^ Ope;, J.A.M. (1999). "From the Streets to the Internet: The Cyber-Diffusion of Contention". Annals of the American Academy of Political and Social Science. 566: 132–143. doi:10.1177/0002716299566001011. ^ Eaton, M. (2010). "Manufacturing Community in an Online Activity Organization: The Rhetoric of MoveOn.org's E-mails". Information, Communication and Society. 13 (2): 174–192. doi:10.1080/13691180902890125. ^ Obar, J.A. ; Zube, P.; Lampe, C. (2012). "Advocacy 2.0: An analysis of how advocacy groups in the United States perceive and use social media as tools for facilitating civic engagement and collective action". Journal of Information Policy. 2: 1–25. doi:10.2139/ssrn.1956352. SSRN 1956352. ^ Shirky, Clay. Here Comes Everybody: The Power of Organizing Without Organizations. Penguin Press HC, The, 2008. Print. Dolata, Ulrich; Schrape, Jan-Felix (2016). "Masses, Crowds, Communities, Movements: Collective Action in the Internet Age". Social Movement Studies. 15 (1): 1–18. doi:10.1080/14742837.2015.1055722. Jenkins, J. Craig; Perrow, Charles (1977). "Insurgency of the Powerless Farm Worker Movements (1946–1972)". American Sociological Review. 42 (2): 249–268. doi:10.2307/2094604. JSTOR 2094604. Jeff Pugh. 2008. "Vectors of Contestation: Social Movements and Party Systems in Ecuador and Colombia." Latin American Essays XXI: 46-65. Temelini, Michael (2013). "Dialogical Approaches to Struggles Over Recognition and Distribution". Critical Review of International Social and Political Philosophy. 17 (4): 2–25. doi:10.1080/13698230.2013.763517. "Dictionary - Definition of Social Movement." Webster's Online Dictionary. Web. 23 Feb. 2012. <https://web.archive.org/web/20130921162010/http://www.websters-online-dictionary.org/definitions/Social%20Movement>.